One of the things I’ve been thinking about recently is the concept of ‘search modes’, i.e. the notion that certain types of information-seeking behaviour exist independently of any particular context or user. For example, “locating” and “exploring” are activities that are common to all sorts of contexts (e.g. web search, enterprise, mobile etc.) and all sorts of users (novices, experts, etc.). If we could define a system of search modes, and validate them empirically, then we’d have a valuable ‘lens’ through which we could recognize common patterns of information seeking behaviour. 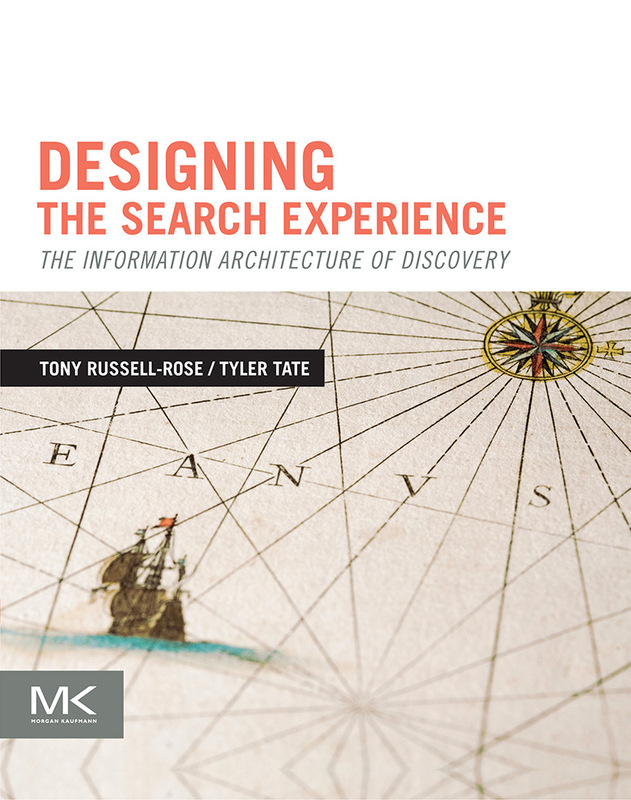 But more importantly, we’d also have a basis for defining the behaviours that a particular search experience should support. It’s the latter aspect that I’ve been focusing on, along with the observation that search modes do not occur randomly. Instead, they tend to cluster, forming distinct chains or patterns. Sometimes these chains consist of two discrete modes, sometimes three or more. Could these patterns suggest the existence of underlying ‘grammar’ that defines the particular combinations that are meaningful or productive? I am intrigued by this possibility, and hope to validate this further through empirical research. But in the meantime, it calls to mind of an earlier piece of work in which we explored a similar notion underlying the semantics of visual communication in the form of icon design. This work has in fact already been published by Microsoft as part of the NHS Common User Interface guidance on Icons and Symbology, but I think it bears a second review in the context of this discussion. I’ve included the relevant section below. For the full text, check out the Microsoft CUI website. Icons are used to communicate information, and in that respect they can be said to exhibit some of the characteristics of human language. For example, icons can be used as symbols to represent concepts in the real world, analogous to words in a language. A picture of a printer can be said to convey as much information about its referent as the word “printer” itself (perhaps more, in some cases). Likewise, a set of icons representing the key concepts in a domain can be thought of as a visual vocabulary for that universe of discourse. Furthermore, iconic concepts can be combined to produce a composite meaning; analogous to words arranged within a sentence. For example, a picture of a printer with a large “plus” symbol in the foreground might reasonably be construed to mean “Add printer”. In this respect, the process of icon design becomes one of developing composite icons from more basic “iconic morphemes” which represent atomic units of meaning. However, once concepts are combined in this manner, the limitations of the approach become apparent. Language is more than just the arbitrary combination of symbols, as there are strict rules of syntax that govern how and where they may be combined. Moreover, it is only thorough a common understanding of these rules that native speakers are able to converse fluently. Without a grammar to resolve the structural ambiguities that arise when concepts are combined, composite meanings are inherently ambiguous, and only simple atomic concepts can be communicated effectively. The purpose of this section is to review some of the issues involved in developing a grammar for icons, and to explore the possibilities of applying such a grammar within clinical applications. However, whilst this work did succeed in enumerating some of the key properties of icons and articulating them as design dimensions, it stopped short of actually trying to define the rules by which iconic morphemes could be combined into meaningful composite units. In other words, it alluded to the existence of a grammar, but did not try to define it. Moreover, a further fundamental difference is that the focus of the previous work was on exploring the role of certain icon design dimensions (such as shape, colour, size, etc.) within a classification framework defined by the key criteria of intensity and polarity. By contrast, the focus of the current work is on developing a vocabulary of symbols to represent real world objects (such as “patients” or “medications”) and actions (such as “add” or “delete”), and exploring ways in which these symbols can be combined to form meaningful composite units (such as “Add Patient”). Table 7 shows an example of a simple icon grammar, consisting of a single noun (“patient”) and a number of verbs (“search”, “add”, “delete”, and “edit”). 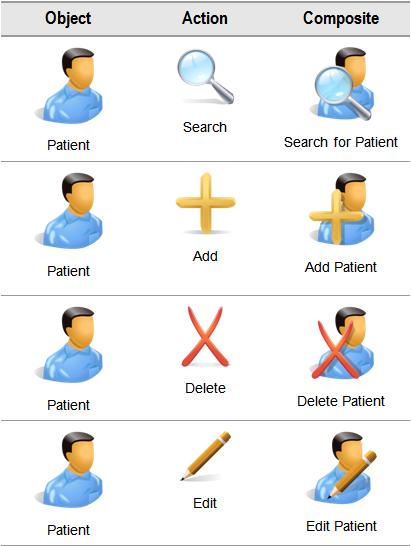 As can be seen, we can combine these basic icons to form more complex, composite meanings such as “Search for patient”, “Add patient”, and so on. 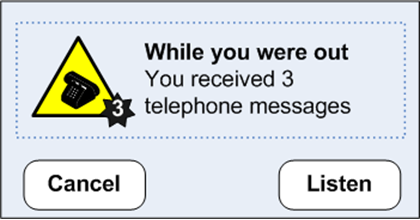 However, despite these limitations, most users would be able to interpret the correct meaning of such composite icons in most contexts, particularly if presented with the appropriate label. Moreover, the meaning of such icons is further clarified when combined with an appropriate semantics. Figure 5 and Figure 6 show the same four composite icons within the context of a toolbar, consisting of four action buttons. The toolbar is attached to a panel showing a list of patient records. In Figure 5, no patient record is selected, so it is not possible to “edit” or “delete”. This is reflected in the state of the buttons, which are disabled for those two verbs. By contrast, Figure 6 shows the same toolbar with a patient record selected – in this case, we see that all four buttons are enabled, in keeping with the contextual semantics of the four verbs. The semantics can therefore be used to reinforce the composite meanings created by the icon grammar. The example above explored some initial possibilities of an icon grammar consisting of nouns and verbs. But what of adjectives? Can we extend the idea by using icons to describe an object in terms of the attributes it possesses? Nonetheless, we can combine these basic symbols to form composite meanings such as “cefotaxime, regular IV injection”, or “sodium chloride, continuous IV infusion”, and so on. However, instead of being used as labels for action buttons on a toolbar, with an associated semantics, these iconic morphemes are being combined to provide a visualisation of qualitative information to aid rapid assimilation of complex data. However, a brief review of these attributes exposes the limitations of this approach – the reason the example in Table 7 is plausible is that the range of meanings being encoded corresponds to a small, finite set of (arguably) learnable symbols. In the case of other attributes, such as route or form, this assumption no longer applies. Consequently, any attempt to encode the full range of values for these attributes using an arbitrary symbology would place highly unrealistic demands on the user. Likewise, this approach would be unsuitable for the display of quantitative information such as dose or frequency. List all the things for which icons will eventually be needed (for example, messages, prompts and so on). List both generic and specific concepts.